Code of Practice for Safe Work on Roofs. Are You following the: Provide, Protect and Practice Method? Provide your tradesmen with a safe working environment…. Protect your Company by complying with the correct safety procedures…. Practice safe work on roofs following the Occupational Health and Safety Act…. Work on roofs above two meters or situations with similar potential fall height. When concrete or semi-glazed tiles are used and the roof surface is more than 20 degrees. Where dry/clean fully glazed tiles or metal deck roofing materials are used and the surface is more than 20 degrees. On roofs where surface moisture, oil or other conditions may make the roofing material slippery and the roof surface exceeds 10 degrees. Other situations where the risk assessment shows an unacceptable risk of injury should someone fall. Why choose Roof Rails for Fall Protection? 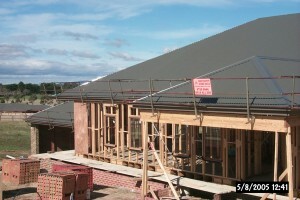 Our roof safety rails are made in Australia. Our hand rails system provides safe work place to minimize the chance of roof falls. Falls from height are a leading cause of death in the work place. General industry OSHA standards require all drops over 2 meters to be protected by a roof fall protection system. The roof is a place where the proper fall protection measures must be taken seriously.